A true story is told of a retired nurse who became a tour guide. She used her descriptive word pictures to show the blind the city where she lived. 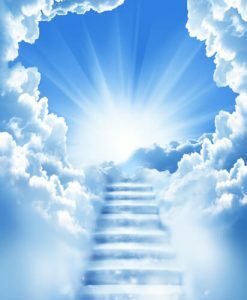 As a widow, I love the word pictures the Lord uses to show us the beauty of heaven in Revelation 21. The city is lit with the glory of the Lord. There is nothing on earth to compare with the splendor of the precious stones, the gates of pearl, and the streets of gold like transparent glass. The Lord loves us and wants us to know He cares how we feel and what happens to us. That’s why He’s building us such an impressive home. To think of spending eternity surrounded by its beauty, makes it well worth the wait. But here on earth, some widows find it difficult when they have health issues and there is no one to talk to. As a result, they can become anxious, fearful, and even depressed. That makes it important for us to keep our thoughts trained above and not on physical things. Recently, I had an ultrasound. Even though I could feel the lump on my throat, I didn’t dwell on it. Four days later, I received a positive report—no cancer! Think of the time I would have wasted if I had played the “what if” game. Life is too short for me to allow fear to cloud my reasoning. If I stabilize my thoughts with a daily dose of scripture and prayer, then I have the privilege of blessing others as I share my victories.